The Alpine Lodge in North Creek, NY provides everything you need to host the perfect small gathering at our private Adirondack lodge. The Alpine Lodge offers meeting, conference, and Adirondack family retreat accommodations with the perfect blend of rustic getaway and convenient comfort. Our excellent location in North Creek, NY is ideal for hosting small, affordable corporate meetings of 10-16 attendees. Just minutes from skiing, hiking, water sports, and more, the Alpine Lodge provides the perfect setting for mixing work with team building and recreational activities. Call today to learn more about our two meeting and conference rooms. The Great Room or Eagles Nest at the Alpine Lodge is a very comfortable venue for Adirondack meetings, and full audio-visual support is available. Breakfast, lunch, dinner, and breaks may be catered by an outside source or you can take a break at one of the restaurants within walking distance of our comfortable Adirondack lodge accommodations. Planning a family retreat in the Adirondacks? Choose The Alpine Lodge for your next family reunion! Our lodge is nestled in North Creek, with a number of family friendly activities nearby such as hiking, white water rafting, tubing and mrore! Family groups of all sizes have held their reunions at our Adirondack lodge to celebrate anniversaries, milestones, special birthdays, or just to catch up. Call us today to plan your Adirondack family getaway! Looking for the quintessential Adirondack Wedding? Planning or attending a wedding in the Adirondacks? 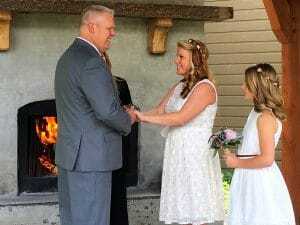 Our comfortable Adirondack motel lodge accommodations are the perfect solution for the bride and groom (or their guests) who want a relaxed and picturesque Adirondacks wedding experience. If you want a larger ceremony and reception, but intimate wedding party accommodations, try the magnificent wedding barn at Burlap and Beams in nearby Thurman and stay with us! We offer group room rates and our backyard is available for outdoor receptions and celebrations if you and your guests book the entire lodge. Our well appointed guest rooms and suites offer DVD Players and free WiFi access. Our central Adirondacks location offers your wedding guests a wide variety of indoor and outdoor activities to choose from year-round. Area activities include skiing, hiking, rafting and biking, all within a short distance of our lodge in beautiful North Creek, NY. For additional information or to make a reservation for your group at our Adirondack hotel, contact our Group Sales Manager, at (518) 251-2451 or email us.